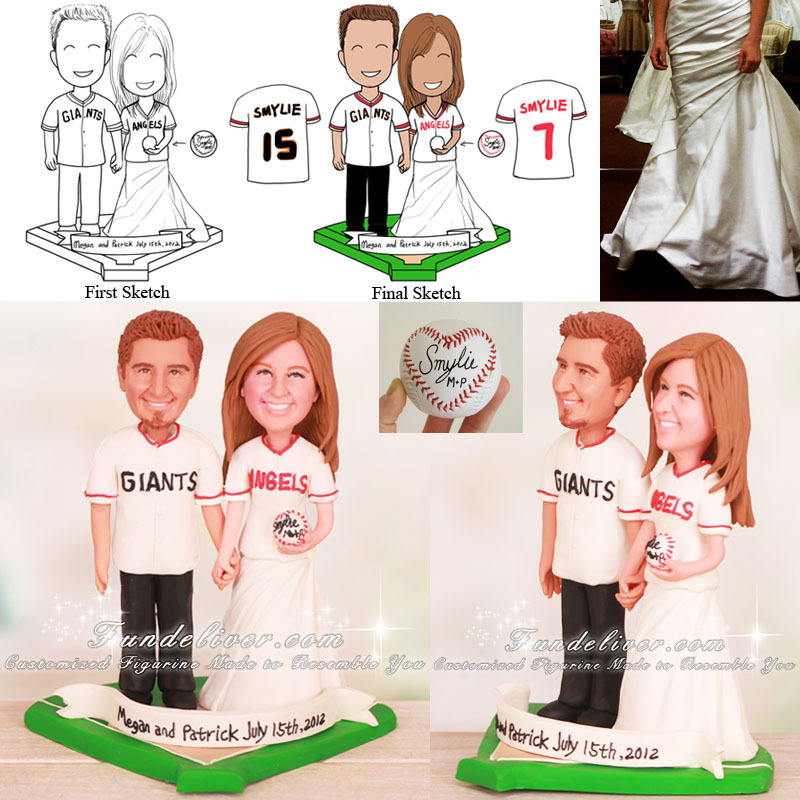 This is a completely customized Los Angeles Angels and San Francisco Giants baseball wedding cake topper ordered by one of our customers. They would like the bride to be standing on the right and the groom standing on the left. They would like the groom to be wearing a San Francisco Giants jersey top with black suit pants and black shoes, the bride to be wearing a wedding dress with a Los Angeles Angels jersey on top. On the back of the jerseys they would like each to have the name "Smylie" on top. The bride's number is "7" and the groom's number is "15" so when looking from the back it reads 7 15, which is their wedding date. 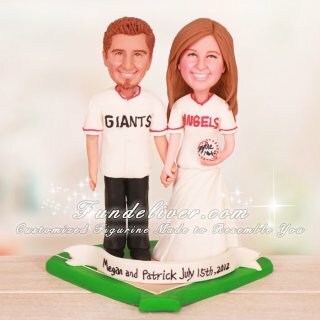 They would like the bride and groom figurines to be standing on a baseball diamond with a banner in front saying "Megan and Patrick July 15th, 2012." Also they would like the bride to be holding the baseball in her left hand. The ball has a heart made from the red laces and in the middle of the heart it reads "Smylie" with an "M + P" written under it. This ball was given to them by their photographer at their engagement photo shoot and they would like it to be incorporated into their wedding topper.